FIS, TURKEY. 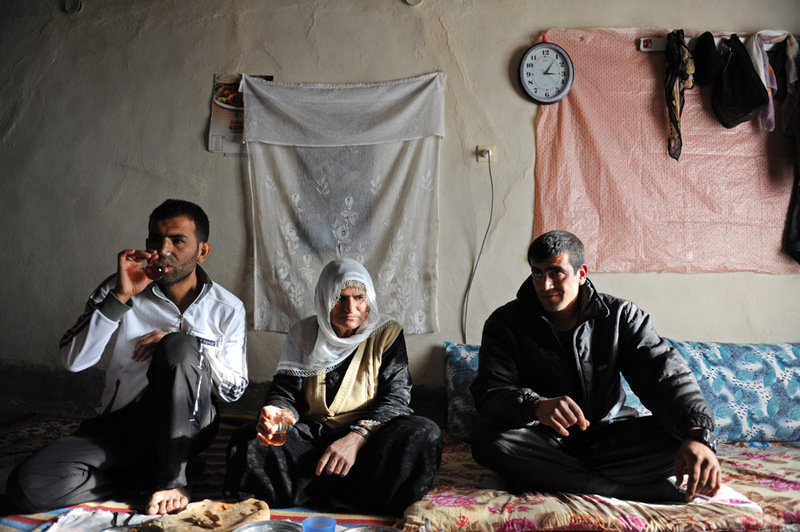 Villagers eat lunch and drink tea in their home on February 24, 2012. Fis is known as one of the first meeting places of arrested Kurdish Workers' Party, PKK, guerrilla leader Abdullah Ocalan; Fis used to be home to 70 families but the Turkish military destroyed much of the town repeatedly in 1993-1994 in retalliatory strikes for the villagers show of sympathy to the PKK guerrillas who they provided food and shelter to ("They are our sons," in the words of one villager), and now only seven homes have been rebuilt in Fis after a period of forced exile from the village and everyone is too scared to provide their name.